If you’ve been paying attention this morning, you’re perhaps somewhat aware of a program Microsoft has in place called Mobile Acceleration Week (part of its BizSpark program), where 12 hand-picked startups can access hands-on support and training to build compelling apps for the Windows Phone platform. MAWs happen all over the world all year long, but I was lucky enough to catch up with some of the participants of New York’s Mobile Acceleration Week, and was pretty pleased with the apps I saw. Microsoft gives each startup 60 days to push the app to market, so don’t get too excited and start hunting through the Marketplace. You won’t find what you’re looking for just yet. But considering that today’s theme (at least in my world) seems to be the state of Redmond’s mobile app platform, I thought it’d be worthwhile to give you a look at where the Marketplace is headed, and what you might find there in the coming weeks. Flud launched on the iOS platform back in 2010 and made quite a name for itself, winning the UI design award in 2010 and joining the likes of Flipboard and Pulse as one of the top 3 news reader apps on the platform. The app has since launched on Android, and is now looking to get its feet wet with Mango. So how did the company bring that award-winning UI to a platform with a totally different style than iOS and Android? 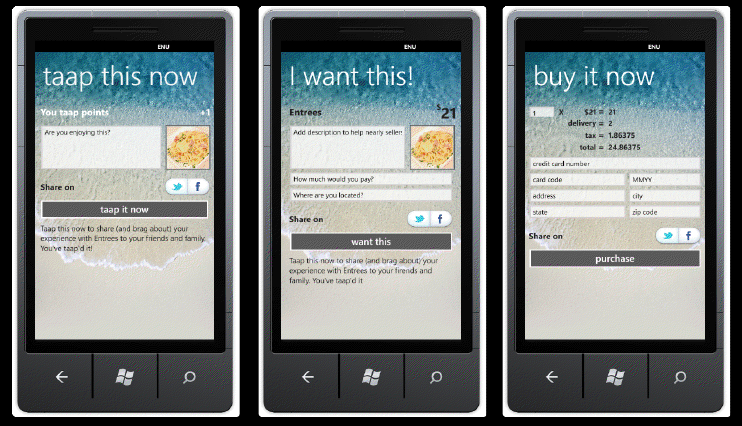 In short, they built a brand new Flud — an app suited to the Metro UI of Mango that takes advantage of unique WP7.5 features. Within Flud for Windows, the user will be able to access their personalized news feed just like any experienced Flud user does now. But it goes further than that. Flud has built in a prominent social layer, allowing users to see what their friends read in a dedicated feed, and check out user profiles, too. I won’t spoil the surprise for all the features, as I’m sure that’ll be announced very soon, but you can expect to see the same features that are coming to Mango on iOS very soon, as well. 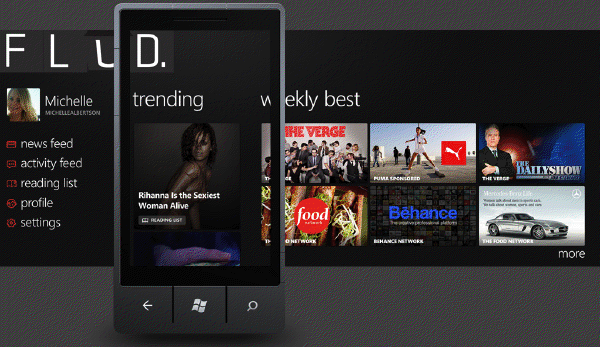 The Windows version of the app will hit the Marketplace no later than early January. You may recognize Get-A-Game from your iPhone, but if not perhaps it’ll catch your eye over on the Windows platform. The app allows users to locate a pick-up game for any sport in real-time, while offering sporting goods services and stores to market promotions directly to users on the Get-A-Game map. I know what you’re thinking, and I’ll stop you right there. Obviously, if you search Central Park in Google Maps you’ll see one little red pin land smack dab in the center of that 843-acre park. But thanks to one lucky intern, Get-A-Game has geo-tagged each individual court in each park to make sure that users can find where they’re going and get their game on. The app has integrated with Facebook and MeetUp, with further social network integration in the works. A free beta version is currently available on iOS but try not to get too attached. 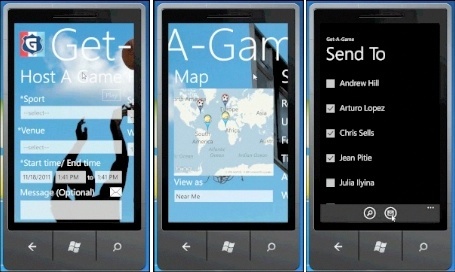 Windows Phone 7.5 gives a new look to every app, and Get-A-Game is no different. Bing will handle all of the mapping, for example, while the rest of the app will take on that Metro panoramic feel. Expect to see this one hit the Marketplace in mid-December, just in time for you to make your New Years Resolutions. The moment I first heard about this app I thought it’d be perfect for my dad, who travels at least once a week. (Dad, download this app.) It’s already up and running on iOS and Android, but in December it’ll launch on Windows with a host of new features that will make it more of a service than an app. As of right now, the app offers up airport directories, ratings and reviews for shops within the airports, social media sharing, itinerary management, wait times for security lines, and reviews/tips for airports. 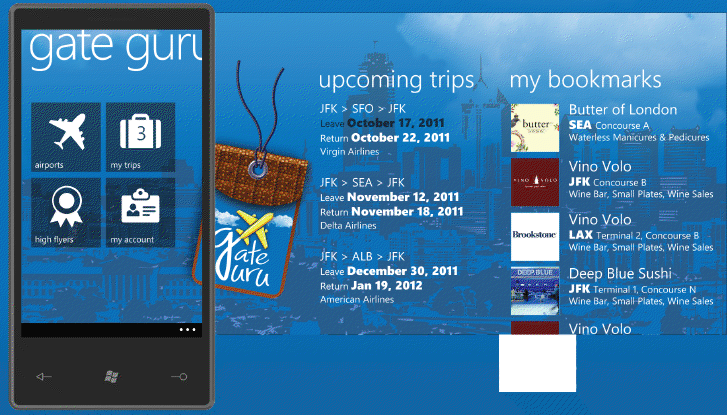 When it launches on Windows Phone, the new and improved GateGuru version 3.0 will include flight status info, push notifications, baggage claim info, food ordering and delivery, and transit-related features. In other words, if you fly more than twice a year this may be the app you’ve been looking for. And with versions available across all three of our major platforms, you really don’t have an excuse anymore. Shop much? If so, you should definitely get acquainted with Taap.it. The app lets users check in to items rather than places, at which point users can purchase the item and rate it. It’s a Foursquare of sorts, but instead of getting points for being somewhere, you get Taap.it points for interacting with individual items, whether it be an entree on a menu or a pair of shoes at the FootLocker. But the user isn’t the only one who gets to enjoy Taap.it. Listing items for sale is as easy as taking a picture and typing in a little info. The only thing is that I’m not sure everyone will immediately understand the concept and be able to enjoy it. Buying and selling through social media is an excellent idea, and the more Taap.it stays focused on that the better. Taap.it is currently available on iOS and Android, with a Windows Phone version on its way around Christmastime. These are just a few of the 40,000+ apps currently or soon to be available on the Windows Phone Marketplace, and while they may not be “new” per se, Mango puts things in an entirely different light. So if you’re planning on picking up a Windows Phone, or happen to be one of the early adopters, these are just a handful of the lesser known iOS/Android apps that’ll be making the migration with you.